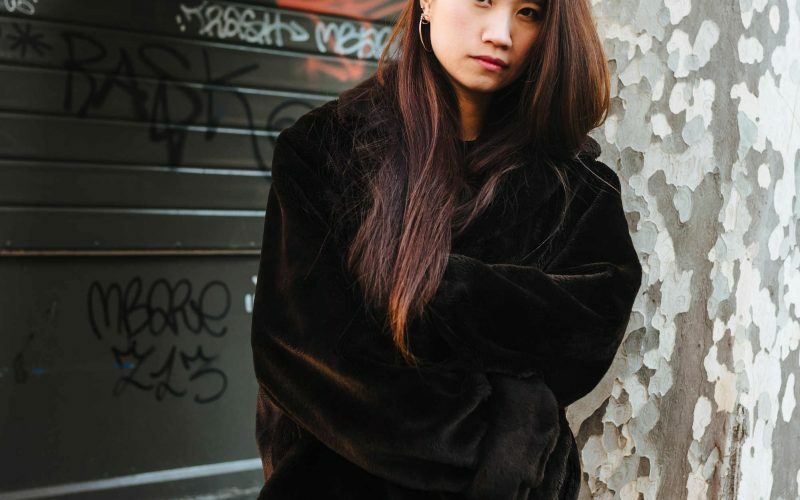 Interview: Flora Yin-Wong | AS IF. NO WAY! Flora Yin-Wong, sometimes known simply as: Flora, is an artist for whose work beautifully suits the term ‘sonic montage’ and sometimes, in the more atmospheric pieces: ‘sonic watercolour’. Her music is light and weightless, and somehow seems distant and emotionally evocative. Ambient, mostly arrhythmic and abstract, it paints a picture of the future as if it were the past in a part-nostalgic, part-ominous melee of different sometimes harmonious, sometimes discordant acoustic and synthesised elements. We caught up with Flora via email to discuss her productions and influences in further detail. Flora: London, but will be temporarily relocating to Tokyo this Spring. AS IF. NO WAY! : When did you start DJing and what kind of genres / styles did you start off playing? Flora: About 8 years ago. I started a clubnight with my partner at the time, and was playing mostly house and edits etc. AS IF. NO WAY! : Your style is very distinctive with a quite a diverse melange of musical ideas and motifs. What styles of music did you first start experimenting with? Flora: I started a band with some friends in my teens, kind of messing around with a guitar when I was into ‘art rock’ like Comanechi and Headless and Snow White, but in terms of production a bit later it was mostly analogue house and techno… or I guess just mostly electronic and beat-driven stuff. AS IF. NO WAY! : Do you use any acoustic instruments in your work? Flora: Yeah I use bits from a violin, a yanqin and various traditional Chinese instruments from my mother as she’s an opera singer/writer, some guitar, and recently a kemence, so whatever I have around I guess, but am specifically drawn to interesting/traditional string and percussive instruments. AS IF. NO WAY! : How do you process them? Flora: Using various plug-ins and processing to make them partially unrecognisable. I tend to dislike many acoustic sounds tbh. AS IF. NO WAY! : Has your taste changed as a result of your DJing and exposure to clubs? Flora: I think I went to clubs and started DJing because of my taste rather than the other way round. AS IF. NO WAY! : At your Cafe OTO performance with Kara-Lis Coverdale your set seem quite field recording based and textural. Do you record these sounds yourself or do you use library sounds or are they entirely synthesised? Flora: It’s a mixture I guess, many of these are altered field recordings, from travels and whatever environments. But also like to use some found sounds and to synthesise others. AS IF. NO WAY! : Your music seems very bright and ultra-futuristic. That sense of mysticism and futurism was especially obvious in your recent Boiler Room set for the Blade Runner 2049 special. Flora: It’s not something I have thought about tbh. Most of the sentiments are purely instinctual rather than intentional. AS IF. NO WAY! : Some of your music has quite a cinematic quality. Have any movie soundtracks particularly influenced your work? Flora: Not really, increasingly I don’t feel really connected to or particularly interested in film especially when it comes to the music tbh. AS IF. NO WAY! : What are your favourite labels at the moment (historical and current)? AS IF. NO WAY! : Is there any music from other countries aside from the UK that you draw inspiration from? Flora: Yeah, I think you have to be careful about appropriation but I think if you are conscious about how you bring together influences from cultures outside of your own it’s a really interesting/fun experience. But have been interested in all sorts, again mostly traditional music but also some modern from Turbofolk to Russian car rap to kizomba and dabke. AS IF. NO WAY! : Your track on PAN’s Mono No Aware compilation, ‘Lugere’ has quite an interesting use of vocals and language. Firstly, what does the title mean? How much do you think vocals are important in music (yours and others)? Flora: ‘Lugere’ comes from Latin, ‘to mourn’. I struggle with vocals in music a lot, it’s not usually a medium or sound that I find naturally appealing, so I don’t have much of them in my own music. But this track, it felt quite personal so I used my own. AS IF. NO WAY! : Do you think meaning / emotion can be conveyed as well by musical instruments / synthesised / recorded sound as the human voice? AS IF. NO WAY! : Have you been to any interesting DIY music spaces / warehouses? If so, does one in particular stand out? Flora: I think the most interesting DIY spaces were the most unexpected ones for me, e.g in a room covered in boxes and inflatable dinghies banging out techno on the 14th floor of an industrial Hong Kong high rise in the suburbs of New Territories, or Rail Up in DTLA felt quite surreal. AS IF. NO WAY! : Thanks Flora!